Eczema is the term for a group of medical conditions that cause the skin to become irritated. Eczema affects about 10-20 percent of infants and about 3 percent of adults and children in the U.S. Most infants outgrow their eczema by age 10. The most common type of eczema is known at atopic dermatitis or atopic eczema, and in some people outbreaks can occur throughout their lives. October is Eczema Awareness Month, and since we treat a fair amount of eczema at the Center for Dermatology and Laser Surgery, let’s help with that awareness by providing some information on this most irritating skin condition. Itching is the main symptom of eczema, no matter where it occurs on your skin. Often the itching begins before a rash shows itself. When the rash develops, it is usually on the face, wrists, hands, feet, or the back of the knees. Areas affected by eczema will appear very dry, scaly, and thickened. 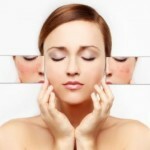 When the person has fair skin, these areas may appear reddish and then turn brown. In those with darker skin tones, their eczema can affect pigmentation, either darkening or lightening the affected area. In infants, eczema usually shows up on the face and scalp, where it can produce an oozing, crusting condition. It has been difficult for science to find a direct cause for Eczema, but it’s thought the condition is linked to an overactive response by the body’s immune system to an irritant. The irritant itself doesn’t cause the scaly skin and itching, it’s your body’s immune response that causes these symptoms. In some people, they can have an outbreak of eczema in response to certain substances or conditions. For some, these may be rough or coarse materials. For others, exposure to certain household cleaners or soaps can be the trigger. In others, it may be animal dander or simply feeling too hot or too cold. Stress can make eczema worse. Eczema is commonly found in families with a history of other allergies or asthma. At the Center for Dermatology and Laser Surgery, we can usually diagnose your eczema from a simple skin exam. If we think it is allergy triggered, we may do patch testing to find the allergens responsible. For treatment we have many options: prescription topical creams, oral medications, and narrow band UVB light therapy. Do you think you have eczema? We can help. Call the team at the Center for Dermatology and Laser Surgery, (503) 297-3440, to schedule an appointment. October is Eczema Awareness Month. At the Center for Dermatology and Laser Surgery, we see a lot of this irritating skin condition and want to share some information with you if you have eczema. Eczema causes the skin to become inflamed, itchy, and irritated. There are different types of eczema. The most common type is atopic dermatitis. Only about 3 percent of adults in the U.S. develop eczema, but the condition tends to be chronic. Genetics tend to play a role. People with eczema often have a family history of allergies. In fact, a person could have all three conditions called the atopic triad: Eczema, allergies, and asthma. Even young people can get eczema. One in five infants develops the condition. But it usually goes away by the time they reach puberty. Eczema can start as an itch and develop into a rash. That’s why eczema is sometimes referred to as “the itch that rashes.” The rash is more common on the face, back of the knees, wrists, hands, or feet, but it can appear anywhere on the body. The dry pink rash becomes thicker with time. In infant eczema, the rash can become an oozing, crusting condition, indicating the skin has become infected. The exact cause of eczema is still a mystery. Like allergies, eczema can be a byproduct of the body’s immune system overreacting to an irritant. Contact with rough or course materials or even sweat. Dry weather or indoor air. Exposure to allergens such as pollen or pet dander. Exposure to fragrances or chemicals. Stress (either emotional or from an illness). Do you think you have eczema? There’s no reason why you should suffer. We’ll help put an end to the itch. At the Center for Dermatology and Laser Surgery, we treat eczema in many of our patients. We can diagnose the condition by simply examining your skin, asking you a few questions, and conducting an allergy test if allergens are involved. We can help treat the itching and rashes with prescription topical creams, oral medications, and light treatments. And if the rashes become infected, we can prescribe you antibiotics. Call the Center for Dermatology and Laser Surgery at 503-297-3440.